Back spasms saw stopped multi time world champion “Sugar” Shane Mosley (47-9-1, 39 KOs) for the first time in his glorious twenty year career in his bout with Anthony “The Man” Mundine (45-5, 27 KOs) at the All Phones Arena in Sydney, NSW on Wednesday night. Mosley was ruled out by Doctor Lou Lewis and referee Raul Caiz senior but the three division titlist was being dominant by an impressive Mundine who put on his best display since edging Daniel Geale in 2009. As in his bouts against Vernon Forrest, the shorter American, who had a two centimetre reach advantage, had trouble with get Mundine’s left lead and was forced to fight mostly going backwards. Coming down from 168 pounds in 2008 , Mundine’s size and strength was evident as he bullied Shane both outside and in close. 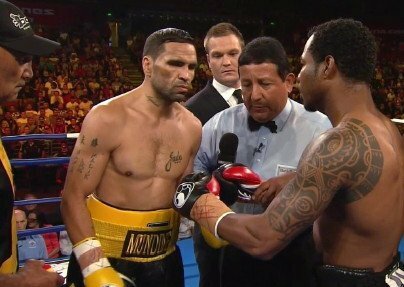 In the best exchange of the fight, Mosley stunned Mundine with a right hand through the thirty eight year old local’s high guard in round four but was then rocked himself seconds later. Mosley looked to tie up but as Mundine stepped back he fell to the ground. Caiz ruled a slip. Anthony continued to set the tone in the fifth and sixth before Dr Lewis was called in and stopped the fight before the start of round seven. Mosley, coming off a points win over Pablo Cesar Cano in Mexico at 147 pounds in May, looked like a 42 year old veteran well past his best but credit Mundine’s jab. The win, which was for the WBA’s International belt will improve Mundine’s no. 10 ranking going in. The former two time WBA “regular” super middleweight and IBO middleweight champion was ahead by 58-56, 58-56 and 60-55 at the end of the sixth. I had it 59-55. In an exciting eight round clash on the under card, Mundine gym mate Renold Quinlan (6-0, 3 KOs) gave away seven pounds scoring a clear decision over Ghan’s Joseph “Pride of Osu” Kwadjo (21-7, 16 KOs). Quinlan, ranked 11 by the ANBF at super middleweight, rocked the tough African a number of times but was also caught himself as he squared up looking to land heavily. At 24, and just three bouts back since a two and half year lay off, the 6 foot Quinlan, who has Aboriginal and Fijian heritage, looks a good prospect. Mundine’s second cousin, Rugby League star Blake Ferguson was outpointed by fellow pro debutant Luke Turner in a heavyweight bout over four by two minute rounds.